The ability of display screens to accurately present fine image details is specified by the visual resolution which can be measured and evaluated according to the IDMS (International Display Measurement Standard issued by the International Committee for Display Measurement, ICDM). In the second half of the year 2015 some display metrology laboratories started to notice conceptual conflicts when trying to apply the procedures of the IDMSv1p03b, June 2012, to display screens with non-standard sub-pixel arrangements (e.g. RGBW). That version of the IDMS had been written for computer monitors with a distinct fixed relation between sub-pixels and pixels of the display. For this class of devices a pixel is defined as the smallest unit that can display the full range of luminance and chromaticity. After a period of controversial discussions, the ICDM on May 24, 2016 finally accepted a series of editorial comments and explanations that are meant to provide a safe basis for those who have to perform resolution measurements during the time period until the next version of the IDMS (i.e. Version 2) will be ready and released. The updated section 7.2 requires reporting of the Michelson contrast for the smallest grille line width to avoid obfuscation by application of thresholds for pass/fail decisions. 1. Replacement of the modulation thresholds by specification of the luminance modulation as a function of achromatic grille line width (a modulation transfer function). 2. Extension to grille patterns of primary colors in combination with black. This paper is meant to introduce the background on which evaluation of visual display resolution is based and to present the procedure for its measurement according to the May 2016 updates of the IDMS which may be applied to non-standard subpixel layouts in a non-ambiguous way. Technical specifications of display screens used as computer monitors or as TV-video screens should also inform the user about the ability of the display to reproduce fine details of the image content to be shown. The finest details that can be displayed will be of similar size as the smallest entities of the display that can be electrically controlled to reproduce the full range of luminance and chromaticity of the display screen. In the case of flat-panel displays with fixed matrix structures the smallest entity able to reproduce the full range of luminance and chromaticity is usually called pixel (short form for "picture element"). In CRT monitors however, the pixels were not rigidly coupled to the individual phosphor dots, but they were rather determined by the diameter and the profile of the electron beam and its timing. So the width of lines (with Gaussian profile) and their spacing could be controlled electrically in CRTs, but these are both fixed in flat-panel displays by the manufacturing process. Even in flat-panel displays the ability to independently control individual pixels and their sub- pixels may be limited by electrical effects (crosstalk) and by scattering of light from one sub- pixel to an adjacent one (halation). That means that the visual resolution of flat-panel display screens is not directly given by the addressability which is commonly specified as the dimension of the sub-pixel matrix (e.g. 1920x1080x3 for HD and 3840x2160x3 for UHD). Additionally, the traditional way of composing one square-shaped pixel from three stripe-shaped sub-pixels, each providing one of the primary colors, R, G and B, is recently being complemen- ted by alternative sub-pixel architectures (e.g. RGBY, RGBW, PenTile) and new techniques of grouping sub-pixels in the process of presenting image information on the display screen (sub- pixel rendering). Sub-pixel rendering techniques can be applied in the temporal domain (e.g. with projectors by presenting several sub-frames within one frame) and in the spatial domain (with direct view displays based on spatial integration of the human visual system), they are forming pixels on demand, depending on the image content, from adjacent sub-pixels, thus abandoning the fixed relation between sub-pixels and pixels previously common to flat-panel displays [1, 2]. The effect of alternative sub-pixel layouts on measurement and evaluation of the visual resolution of direct-view display screens will be described in this paper. When we are reading a printed book we directly experience some basic properties and limitations of the human visual system. The ability to recognize printed characters is depending on the size of the letters (fine print is much harder to recognize) and on the illumination condition of the printed material (recognition is more difficult in dim or dark environments). We instinctively try to improve reading conditions by moving the book closer to our eyes to increase the apparent size of the letters and by turning the page to face the direction from which most light is coming to improve illuminance. We also are aware of the fact, that e.g. low cost newspaper printing is harder to read than the letters printed in books and high-quality magazines. The contrast (i.e. ratio of reflectance of bright and dark areas on the printed paper) is about 5 in the first case, and usually above 10 in the latter case. The relations between visual recognition, contrast and viewing distance will be explained in the following sections of this paper. Recognition of visual information by human beings is largely related on contrast, which is the "difference in appearance of two parts of a field seen simultaneously" according to the CIE ILV (International Lighting Vocabulary). 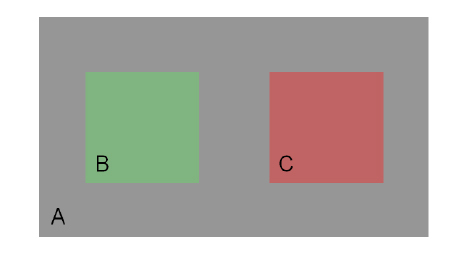 Figure 1: The field A and fields B and C are perceived with different brightness, this difference is the cause for a set of contrasts between A, B and C.
Figure 2: The field A and fields B and C are perceived with different brightness and color, this difference is the cause for a set of contrasts between A, B and C.
The human visual system has been optimized for recognition of contrast over millions of years of evolution, since the contrast of reflective objects and scenes (e.g. our natural environment) remains fairly constant over a wide range of illuminance levels, i.e. from bright daylight to dim twilight and indoor levels. Even though the most important visual clues for the human visual system are based on the luminance contrast, color is adding important detail information. The contrast of the fields B and C in Fig. 2 thus is not only given by the difference in luminance of the fields, but also on the difference of chromaticity, i.e. the measurable attributes of perceived color. How well does a display screen reproduce input signals ?